At some point it will be necessary to remove the back end of this site that powers the log-in system. If you'd like access when that happens, please email admin AT harryandginny DOT co DOT uk with your request. Imogen will be in contact with new details when the switch happens! A Pensieve Affair is now complete. Hope you enjoy reading it. If you're over 18, would you like access to all stories? Apologies for this system of registration, but we're being flooded with spam accounts and it's the easiest way of keeping the site secure. The email is checked daily, so you shouldn't be waiting more than 24 hours before your account is online. If you don't hear back within a day, please try again or leave me a message here - my email spam filter gets a little enthusiastic sometimes! I think the site is live again after being broken for what seems like forever. The forums are locked but the fiction archive is working! Many of you know that I've stopped writing fanfiction altogether and have been writing pretty much exclusively original fiction for the past two-and-a-half years. This is picking up pace and doing well - and it's looking less and less likely that I'll ever get back to fanfiction. I'll post the last chapter of 'A Pensieve Affair' soon, but the other couple of stories on the site may never get done, or there may be odd chapters posted when and if the whim surfaces. I've had a blast doing the fanfic and I've learnt so much from it all, but I think this is the end of the road. I'm having more fun with my own characters than I ever had with JKR's. I'm going to lock the forums later this week. They'll still be open for registrations so that people can read the stories, but not for posting. I'll also keep authorising requests for the more mature stories if you email admin AT harryandginny.co.uk but you may have to be patient for a little while! Essentially, I'm leaving this place up as an archive. There might be odd updates (please join the mailing list if you want to know about those), but nothing much more. If you want to keep up with me and my writing then please get in touch. Thanks so much for reading in the past and for still leaving me the most amazing reviews and comments now. It's made a huge difference to me and I really appreciate all of you. Happy Book 7 everyone! 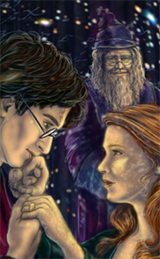 I'm sure there'll be loads of discussions on Deathly Hallows on the forums to do with JKR, our favourite couple and how the series ends. My last chapter of 'A Pensieve Affair' is about to head off to my beta readers, so you should be getting an update in the next week. Please join the mailing list if you'd like a nudge when it's posted. After that, I'm not sure. I'm not really feeling inspired to write fanfic at the moment as I'm really enjoying spending time with my original stories. I will update occasionally when the whim strikes me and eventually the unfinished stories will get finished off... but I won't be writing much in JKR's world in the future. The mailing list is the place to be, but after PA is over, there won't be regular updates to the site - just when and as the mood strikes me. If you're waiting to be authorised for the adult section, I have got your email and I'll authorise you on Monday at the latest. I've been very busy with work and I've got behind. Very sorry! Forgive me? Well, it's been a while, but I've been sucked into writing original fiction lately. Now that the book has been sent off to agents, I can finally get back to polishing off the Matthew and Hope story. I can't say when exactly it'll get posted but I promise it'll be completed before the last book comes out in July. In the meantime, enjoy the stories that are here, or check out my original stuff on the other site. We've got a new story today for you, written by Bart, it is an alternative version of Hope and Matthew taking Holly shopping for an Owl, they wouldn't prank her as well would they? 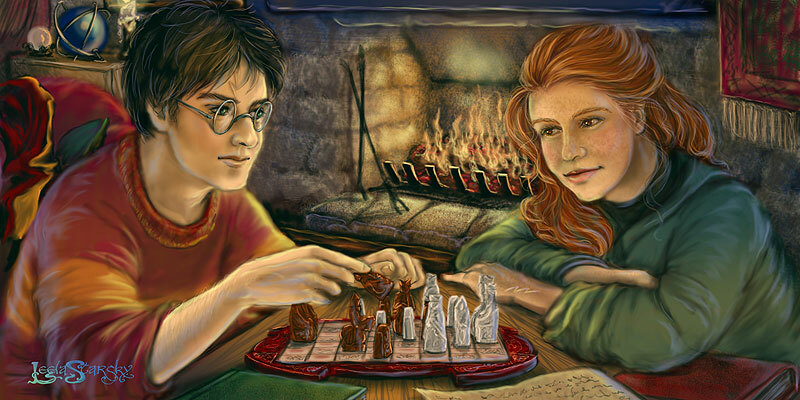 Some of our members are taking part in this years Nanowrimo, follow thier progress here, and see who is leading The Great Harry and Ginny Word War 2006! Just to let you know that I won't be here posting any story updates during November. As you know, it's Nanowrimo that month and I've got an original plot bunny that's demanding to be written - so unfortunately, Hope and Matthew are being abandoned for a few weeks. As soon as Nano is over I'll post the last chapter, then the epilogue for Christmas. If you're dying in the meantime, email me and I'll send you what I've got! Mr Pump AKA Windsong has posted the latest chapter to A Thorn in the Sand, entitled 'Bumpy Landings' it can be found here. Holly has her first flying lesson, does she do as well as her father and older sister before her? Read it now to find out! Mr Pump has another new chapter up for our reading pleasure. Have a look here to read chapter 6, entitled 'First Steps'. How do you think Holly's first Potions lesson goes with Snape? It's time to announce that Chapter 5 to Mr Pump's 'The Thorn in the Sand' is now posted for your reading pleasure here. This chapter is called 'Hats and Ghosts'. What House will Holly end up in? As promised, Chapter 25, part the second is posted and ready to go. Hope you enjoy seeing how Harry really took the news! Chapter 25 of A Pensieve Affair has now been posted and you can read about what happens after the 'I love you' here. The chapter has been split in two because it was an absolute whopper, so I'll get part 2 of the visit to Hogsmeade up on Tuesday, so you see how things really go with Harry! Alphie's outtake to 'A Pensieve Affair' has been posted here and is called 'Payback is a Witch'. It's part of the 'mature themes' area of the site, so please email for access if you don't already have it and want to read the story. My next chapter of 'A Pensieve Affair' is enormous and is currently with my beta readers. You can expect a double length chapter to be appearing in the next day or so, and it follows on from the end of Alphie's outtake. Secondly, a little bird whispered that Alphie's story may soon be up for everyone to read. Thirdly, I also heard that Imogen is nearly finished her next chapter, and should have it in my email box in the next week for me to drool over edit. Please cross all fingers and toes that I'm not hearing imaginary voices. Now that I've finally learnt how to upload things, I'm pleased to announce that Chapter 3 to Mr Pump's 'The Thorn in the Sand' is now posted for you to read here. It's called 'The Journey Begins'. The new friendship between Holly, Chelsea and Simon continues to evolve. The next chapter to Mr Pump's 'The Thorn in the Sand' is now posted for you to read here. It's called 'New Friends' and in it, we get to meet the Meyers properly. Congratulations to our very own Drie, whose story "Pictures of You" is Story of the Week over at Phoenix Song! Our SotW this week is a beautiful, emotional story by Drie called "Pictures of You." Ron is looking through the family album, reliving memories of his life with Hermione. This one's a tear-jerker: have your tissue handy. And, of course, don't forget to review! We have a new chaptered story just beginning on site, this time all about Holly and her first year at Hogwarts. It fits in about 2 months after the point where 'A Pensieve Affair' ends, and is by our very own Mr Pump. The story is called 'The Thorn in the Sand' and the prologue 'Owls and Ice Cream' is posted here. Alphie's outtake to PA should be arriving on site any day now. If you have received any email looking as if it's from the website today, please don't open it, or any attachment, or click on the link from within it. It is not from us, and no bulk mailing is ever sent through the boards. The boards should be up and running again later today after our latest upgrade. Chapter 24: Muggling Along has just been posted here. Find out what's happening next in 'A Pensieve Affair' world! No more updates from me until 26th July, but there's an outtake by Alphie that should be along any day now. That takes place immediately after chapter 24 ends. Enjoy the chapter, and don't forget to let me know what outtakes you'd be interested in. Summer holidays are a-coming up in about a month's time. So, as a thank you to you all for being such fantastic readers and reviewers, I'll write an outtake of your choice for 'A Pensieve Affair' at the end of July. What would you like to read? What bunnies have nibbled at your toes that you'd be interested in finding out more about? It doesn't have to be from the timeline of PA - it could be earlier and involving Flint, or a spin on of something after the story ends. It could be something from Matthew's pov. Thanks to everyone for waiting so patiently. I'm feeling much better now and itching to get back to this. Unfortunately, work commitments always get mad at this time of year, so I've only got one more update possible between now and 26th July - up to you whether you want this straight away with a big gap between chapters, or whether you want chapter 24 half way through the month. It's done and ready to go, so it really is fine either way. It's my favourite chapter - I'm itching for you to read it though! Meanwhile, enjoy chapter 23. Hope it was worth waiting for. If you enjoy them, don't forget to leave a review! Almost there, but feeling sick again, so going for a lie down. Here's a snippet to keep you amused until I can get it posted. Can I beg an extension until tomorrow? Despite her anxiety, Hope gave a small smile. The older wizard patted her hand and memories of her childhood wrapped themselves comfortingly round her. When Kingsley had visited he had often taught her silly little rhymes about things to avoid doing at all costs. “And the blast took him forty feet high,” Hope finished, with a grin. Sorry for being AWOL for the past two weeks. I've been ill and not really up to doing much. I'm still far from 100% - the antibiotics I'm on aren't agreeing with me, but I'm back. Much grovelling if you've been waiting on me to authorise your access to the site, and more apologies if you're waiting for the next chapter. At the absolute latest it'll be up before I go to bed tomorrow night (Monday). Imogen says, "The next chapter is almost ready to go. There's a couple of things to run past my betas and we're set. The chapter after that is done already, so there won't be any hanging around there!" Chapter 22: Mind on the Job has been posted here. Loads of apologies for the wait and massive thanks to Bart for his persistence in fixing the site. The next chapter should be along on Friday. Hope you enjoy it! The reviews feature *is* working, even if an error message comes up. All feedback welcome! The next chapter of 'A Pensieve Affair' will be up later today. The forums are currently down for essential maintenance, but as soon as that maintenance is finished and the software is upgraded, we can get the chapter up. Hang on in there - not long to go now! Rzieve has written an excellent outtake to explain exactly how Matthew came to be sorted into Slytherin. Be Careful What you Wish For is essential reading - you'll love it! 'A Pensieve Affair' has just had Chapter 21 added to it. This is where we start to see Hope and Matthew really settle into this relationship, before the mission starts. Hope you enjoy it. I've also seen Rzieve's outtake this morning of Matthew's sorting - which is fantastic. Hopefully that'll be posted soon as well, because I know you're all going to enjoy it. Keep checking back! Chapter 20 of 'A Pensieve Affair has been posted, so that you can find more about Hope's case in Cornwall. Hope you enjoy it! Quite a few of you know I've been reading 'Twilight' by Stephenie Meyer recently (if you've not got a copy yet, go and get one immediately - trust me! ), and with a LOT of coaxing from Alphie, I've jumped sides of the pond and have written fanfic based in the USA! Yes, it was a shock to the system. Yes, I did have to do a load of research. No, I don't think I'd EVER do it again. If you want to read it, I've got it posted on ff.net on my account here Reviews VERY welcome. I've never done this before! Chapter 19 of 'A Pensieve Affair' is now up on the site, and looks at where Hope and Matthew go from here. Updates will be slightly slower for the next few chapters, as they need extensive editing to avoid a continuity problem. Next update will be on Sunday/Monday. Thanks to Bart for all of his hard work with the new plugins, and to everyone for their reviews and emails. I'd like to take this opportunity to emphasize that 'A Pensieve Affair' and its outtakes are for readers over the age of 18. I've suspended an account of an underage reader today. A more suitable rated version of the same story is available on PhoenixSong and the SugarQuill under my author name there for those under 18. You might also want to check out the spectacular picture Leela Starsky did of the A&O wedding. It's linked to in the 'most recent' box to your right, or via a thumbnail near the bottom of this page. It's AMAZING! It's a holiday weekend in the UK, so chances are the next chapter won't be along until Tuesday, but the current one is pretty long and should hopefully keep you going! You also need to make sure you read Alphie's outtake: The Best of Intentions to see what Matthew's getting up to at this point in time as well. Thanks for the patience in waiting for this one. Next chapter is pretty much ready to go already. Alphie's outtake to 'A Pensieve Affair' has been posted here. It's called 'The Best of Intentions' and deals with a little chat that Cora has with Matthew concerning a certain Hope Potter. Sorry guys. The amendments to chapter 17 are taking a little longer than anticipated. I was hoping to get it posted tonight, but I'm not quite finished writing it yet, and then my betas still need to check it over. There's no way I can get it posted today. I'll try my best to get it up tomorrow, but if not, you'll definitely have the next chapter on Saturday, and the one thereafter on Tuesday (that's finished and edited already). Loads of apologies for keeping you hanging. I didn't mean for this to happen at all. Hope you enjoy reading it. Next update should be along on Thursday BUT there will be an outtake posted before then, so make sure you check back soon! Chapter 15 of 'A Pensieve Affair' has just been posted here. How is Hope going to cope without Matthew in her life? If you haven't already changed your bookmarks to the new harryandginny.co.uk domain, please can you do so. A few of you are still using the old elenarda.com route and that's set to expire any day now. Hope you enjoy the latest chapter! 'A Pensieve Affair' has been updated with chapter 14. This time Hope has to go to Matthew's flat to return his things. You can find the chapter here. Hope you enjoy it! The next chapter of 'A Pensieve Affair' is posted for you to read here. Does Matthew escape, or can Hope change his mind? There's only one way to find out! If you want to know the impact of those three little words, the next chapter of 'A Pensieve Affair' is posted here and if you're really, really good, I'll get another chapter to you on Wednesday! We have a new chapter of 'A Pensieve Affair'. It's called 'Leap of Faith' and is the last of the memories in the pensieve game. You can find the chapter here. It's got the higher rating, as it's the unedited version of the chapter. Please email if you'd like access it and don't have it already. Alphie has written the same chapter from Matthew's point of view in the past. It's fantastic reading, called 'As Long as You're Mine' and is posted here. An additional chapter has been added to 'A Pensieve Affair' and you can find that here. This isn't posted anywhere else, so if you do want to read it and don't currently have access, please email admin AT harryandginny DOT co DOT uk with your user name and stating that you are over 18. Hopefully this chapter is going to explain a lot about Hope, Flint and Matthew! Next update on Thursday. Chapter 8 of 'A Pensieve Affair' has been posted: the chapter is really in two parts, and the second installment will be along on Tuesday. This is all about Hope's happiest times with Julius Flint. If you haven't already, please remember to update your site bookmarks to www.harryandginny.co.uk before the old doman lapses. 'A Pensieve Affair' now has a chapter 7 added to it. You can read it here. This time we're back in Matthew's memory to see what went wrong in his relationship with Della. "A Pensieve Affair' has been updated, and now you can find chapter 6 here. Thanks to everyone for the lovely reviews and emails about it. If you don't already have access and would like to read it, please email with your user name (and the fact that you're over 18) and full access will be given. We're now rolling with Chapter 5 of 'A Pensieve Affair', which you can now find posted here. We're heading back into Matthew's memory here, and a very embarrassing one at that! Please email if you'd like access to that fic, and also please remember to update your bookmarks to this site if you haven't already as the old domain is set to lapse soon. 'A Pensieve Affair' now has a chapter 4 here. This time we're dabbling in Hope's memory. Hope you enjoy it. Please email for access if you don't already have it, and don't forget to update your bookmarks. Next chapter is set to arrive on Friday! If you'd like access and don't already have it, please email admin at harryandginny dot co dot uk with your board user name, and stating that you are over 18. Please remember to update your bookmarks, as the old elenarda.com domain name is set to expire in the next few weeks. Could all AOL users on the email update list please note that their addresses are automatically being rejected. If you have an alternate email address we could use instead, please can you let us know. It seems to be affecting about ten of you. Sorry! Chapter 2 of 'A Pensieve Affair' has been posted here for you to enjoy. The next chapter should be along on Friday. If you would like to read and don't have access, please email admin AT harryandginny DOT co DOT uk with your board user name and the statement that you are over 18. Please make sure your bookmarks are updated for the site, as the old elenarda.com domain will be lapsing in the next few weeks. A Pensieve Affair now has chapter 1 posted for you to enjoy. To access this story, please email with your age and your message board user name, and you'll be sorted into a new 'house' to allow you freedom to read where you will! Imogen's new fic 'A Pensieve Affair' is being posted from Friday. As it involves mature themes, access is restricted to those 18 and over. If you would like to read this fic, please make sure you are registered for the message boards and then email admin AT harryandginny.co.uk with your user name and the request. You will then be added to a different user group so that you are free to access all stories on the site. In common with many other efiction archives, we've recently been hit by a hacker who infiltrated the program with an iframe link to a trojan virus. Although we've installed all the updates and patches available for efiction, and we know the site is currently 'clean', we'd advise everyone who visits us to run a virus scan just in case. I cannot apologise enough and we are doing everything possible to prevent this from happening again. Wishing all of our Harry and Ginny authors, artists, readers, betas, and guests a very Happy Christmas with everything you dream of. Apologies for the slight delay with the Christmas story ~ it's developed into a Carpe Diem length fic and I'm typing my fingers to the bone to try and get it done. It's looking like it might be the start to 2006 instead, but A Pensieve Affair WILL be appearing on a web page near here imminently!